Virtual Health and Wellness Center! There are many aspects to feeling your best when you have multiple sclerosis. Many report that alternative therapies (yoga, massage, tai chi, etc.) are helpful in maximizing their quality of life. Each month we will highlight a different health and wellness topic for you to consider on your MS HealthCare Journey. ​Listen to our latest HealthCare Journey radio interview with William Rand. William is a Reiki master and has practiced Reiki and taught full time in classes around the world for the past 27 years. He is the founder and president of The International Center for Reiki Training (ICRT), The Center for Reiki Research and The Reiki Membership Association. He has authored numerous books and articles on Reiki, and is the originator of three forms of Reiki, Usui/Tibetan Reiki, Karuna Reiki and Holy Fire Reiki. A associate dean of NESA, C.J. Allen is certified as a Diplomate of Chinese Herbology by the NCCAOM and in the NADA protocol for Acupuncture Detoxification. C.J. has served as a detox acupuncturist at the Dimock Community Health Center and also as a clinical staff member of Pathways to Wellness (AIDS Care Project) where he assisted Dr. Tao Xie, the director of herbal medicine. C.J. has guest lectured on Chinese herbal medicine at Boston University, Tufts University and the University of Massachusetts Medical School. He maintains a private practice at Acupuncture and Herbal Healing located in Newton and West Roxbury, MA. Tad Campbell, MCN, RD, LD is a registered dietitian at the University of Texas Southwestern Medical Center’s Total Life Care (TLC) MS clinic and also serves as the Education Coordinator for the Clinical Nutrition department in UT Southwestern’s School of Health Professions. CLICK HERE TO LISTEN TO THE INTERVIEW!! Paula is a certified hypnotherapist who recently demonstrated what science calls "Proof of Concept" for a new type of therapy called Healing Light Guided Imagery (HLGI). Chris Manella, PT, LMT, MCMT is the therapy manager for the Andrew C. Carlos Multiple Sclerosis Institute at Shepherd Center in Atlanta, GA which is ranked by the US News &World Report among the top ten rehabilitation hospitals in the nation. 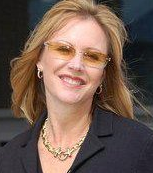 She is both a licensed physical therapist (over 24 years), and a massage therapist (over 15 years). Chris helped to initiate the first inpatient massage program at Shepherd in 2006 for spinal cord injury that continues to present day. Listen to our interview with her to see if massage might help YOU manage your MS symptoms. Mindy Eisenberg is an expert in adaptive yoga for people with multiple sclerosis. She has practiced yoga for 14 years as an instructor and yoga therapist in Michigan at Yoga Spirit. 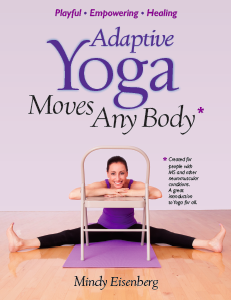 Her book, Adaptive Yoga Moves Any Body contains hundreds of yoga adaptations and photos for people with multiple sclerosis. PLEASE NOTE: The information on this site is provided as an information resource only, and is not to be used or relied on for any diagnostic or treatment purposes. This information does not create any patient-healthcare provider relationship, and should not be used as a substitute for professional diagnosis and treatment. Please consult your health care provider before making any healthcare decisions or for guidance about a specific medical condition.